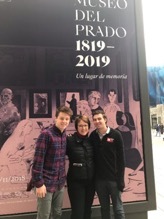 Joey Karczewski ’20 — As I reflect on my time abroad, I often think back to the numerous museums that I had visited. A couple of my favorite include the Mumok in Vienna and the Film Museum in Frankfurt. These Museums were memorable to me because I left each of them changed in some-way. In particular, the Film Museum in Frankfurt had an extremely well curated room on the growth of film as a means of conveying a story. The room began with wheels that when spun, appeared as a moving object. Next was the Camera Obscura, and lastly the first produced films. While the method of using film was interesting in and of itself, what the films chose to capture was even more fascinating. All the films in some way or another captured aspect of the Human condition: a couple kissing, a trains arrival, a silly man making jokes. Because of the steep Museum prices, I don’t that I would have been able, nor would have thought to, visit these museums if it weren’t for the Givens Family Fund. Later on in my semester I had the chance to take a week-long visit to Berlin. It was here that I was able to visit the DDR Museum, Alte National Galerie, the Altes Museum, Jewish Berlin Museum, Topography of Terror, Berlin Wall Memorial, and the East Side Gallery. While this was a more informative trip, I still got to see my fair share of art pieces. There was an exhibit at the Jewish Berlin Museum that I remember vividly. In the basement of the Museum, several Jewish citizens killed in World War II were memorialized. The exhibit was set up in a way that forced one to stand directly in front of what was the main focus. Each part of the exhibit had a piece of artwork created by the individual who was killed. I think this exhibit was extremely moving for me because it made me change the way I look at art. I can’t thank the Givens family, the selection committee, and Wabash enough for enabling me to have an incredible opportunity like this. There are so many other places and museums that I visited that I didn’t list in this blog post. I left my experience abroad with a much greater appreciation for art that will stick with me for a lifetime. I look forward to returning to Europe soon! Isaiah Mears ’20 — Nothing like six inches of snow and an 8 AM class to welcome you back from a semester in the Peloponnese am I right? My time in Greece was always filled with life-changing experiences. However, the most influential part of my journey was watching what I learned in my art history class come to life as I traveled. I believe that liberally educated individuals are at a massive advantage from people who attend a state university or another institution that doesn’t require a well-balanced education. Wabash cultivates problem solvers and critical thinkers, and I think that the cultivation process is seen in the diversity of curriculum we are required to take. During my semester abroad, I decided to take a Greek Art History course to fulfill one of my distribution credits to graduate. 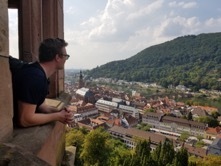 Being a political science major, I was not particularly excited about making an art class, especially in one of the most important epicenters of the arts; and not to my surprise, this ended up being my most challenging course abroad. The Greek people are very in touch with their history and love nothing more than to share that history with others. I learned about material from just about every ancient era of Greek art, but two eras, in particular, would interest me the most both inside and outside of the classroom. The Bronze age and Hellenistic period of Greek art were the focus of my education and travel abroad. The Bronze Age is filled with Greek art and ancient complex civilizations. One of these civilizations, in particular, was on the island of Santorini. 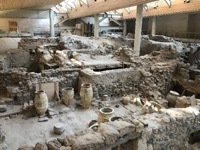 Tucked away at the southern tip of Santorini, Akrotiri’s ruins are one of the Bronze age’s most sophisticated settlements, which prospered for centuries before being eradicated by a great volcanic eruption. Like the Roman ruins of Pompeii, the remains of the Minoan town are incredibly well-preserved. The settlement was all but destroyed when the volcano it sat upon, Thera, erupted, and its inhabitants fled. The volcanic matter covered the entire island of Santorini and the town itself, preserving the buildings and their contents. Even now, visitors can still identify houses and pots. With that being said, the inhabitants of this island must have fled well before the eruption because no corpses have been uncovered from the settlement. Through this scholarship, I was able to visit this ancient site and view the remains with my own eyes. I walked the same path and touched the same walls as the people who lived their hundreds of years ago. I cannot begin to explain how fortunate I was to see what I learned in the classroom come to life. The other trip I was able to go on because of this scholarship was in Italy. Rome is home to many incredible people and places, but the Vatican museums were by far my favorite. I felt like I was living in a movie or a dream as I would wake up in the morning, grab an espresso and some Frittata and walk down the cobbled streets to the entrance of the Vatican. I would be lying if I didn’t say I wanted to see the Sistine Chapel and Saint Peter’s Basilica the most, however, yet again to be able to see what I learned in my textbook jump off the page and come to life right in front of me was remarkable. The statue of Laocoon and his sons would be my favorite piece in the museum. During the semester I had to work on a project with a couple of classmates, and we were tasked with this masterpiece. I was fortunate enough to go with these same classmates and see what we presented on in real life. Without the Givens scholarship, none of this would have been possible. I would like to again extend my sincerest thanks to the Givens family for this unique opportunity. Please continue to foster liberally educated men through this scholarship because I genuinely received a life-changing experience.